People analytics is the use of data and analytical techniques to help managers make more informed decisions around matters of attrition, retention, and inclusion. Some metrics work well to predict future events, others are better at identifying established trends – this is the difference between leading and lagging indicators. For best results, combine quantitative and qualitative data, and always follow up with focus groups. Follow our seven-step guide to launching people analytics and improve your overall employee value proposition (EVP). 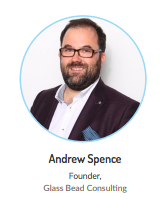 Andy is an HR transformation specialist with over 20 years’ experience. After working for brands such as Deloitte, Accenture and AON Hewitt, he established Glass Bead Consulting, which specialises in the design and implementation of new HR operating models. Andy is a prolific writer, having been published in CIPD, HRO Today Global, Strategic HR Review and HR Transformer Blog. Tim Pointer is the founder of organisational culture, engagement and leadership consultancy, Starboard Thinking. Previous to that he directed HR at Pentland Brands and Diesel, and led HR across Asia-Pacific for Maxxium. Tim is a Chartered Fellow of the CIPD and the work he led at Pentland Brands won the Employee Engagement and Overall Winner CIPD/People Management Awards in 2014. 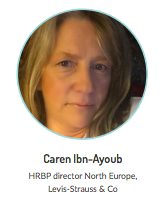 Caren was appointed HRBP, director North Europe at Levi Strauss in July 2014. Her role spans E2E HR in the UK, Ireland, Norway, Sweden, Denmark and Finland. Based in Levi’s Northampton office, Caren’s remit covers the London office, European distribution centre and all North Europe retail and outlet stores. 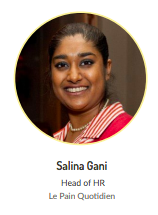 Salina is an HR professional with 13 years’ experience. She specialises in learning and development while being an HR generalist. Her background spans hospitality, restaurants, food retail and food manufacturing. Salina is CIPD accredited, holding an associate professional membership. Tracey heads up HR for Staffline, a national organisation that specialises in logistics, e-retail, manufacturing, driving, food processing and white collar recruitment. Sharing the goal to build and develop the most reliable integrated workforce in the country, Tracey recently implemented the organisation’s tech-driven salary sacrifice strategy. People analytics and data are rewriting HR’s rulebook. Like the sales and marketing functions, the people department is becoming a data-driven force with the power to hit the bottom line like never before. HR’s capacity for measurement has come a long way in the last decade. In the not so distant past, it wasn’t uncommon for larger organisations to be unaware of the exact number of people who worked for them. Today, in stark contrast, many are able to comfortably track data on skills (and their shortages), personal performance, personalities – even happiness and company culture. But just because something can be measured doesn’t mean it should be. The challenge is turning this information into meaningful metrics that are linked to business outcomes, information that can improve an organisation’s agility, capability, innovation, and, ultimately, bottom line revenue. The following pages explore emerging best practices in the field of people analytics, revealing how world-renowned brands are using it to make more informed decisions, enhance employee experience, cut costs and bolster business outcomes. They will provide readers with the inside track on how to start using their data for people analytics activities. At its core, people analytics is the use of data and analytical techniques to help managers make more informed decisions about their employees. While HR has always used dashboards to monitor metrics such as absence rate, cost per hire and revenue per employee, many practitioners are beginning to find limitations in the approach. The criticism is directed at its tendency to operate in a siloed nature, one that doesn’t always relate to wider business issues. “Many of our current management processes are broken, they were set up for the industrial environment of the last century – an example is the annual performance review. People analytics can help us dig ourselves out of this and lead organisations that create meaningful work and have effective business models. Although there’s no one-size-fits-all approach to deploying people analytics – what’s important to one company is highly unlikely to be equally as important to the next – initiatives should align with the organisation’s broader strategies. A tech startup, for example, might just have recruited heavily, and will therefore be focussed on getting the most from its people. A struggling retail business, on the other hand, might need to invest in the negotiating skills of its procurement team. Find better applicants for new positions. Increase employee performance and happiness. We started by asking our interviewees about their experience using people analytics to inform business strategy. All contributors accepted that the rate of change is increasing, and demonstrated that each organisation has varying levels of sophistication when it comes to regularly applying people analytics. The following extracts display two of our leaders’ experience in the pursuit. At Levi Strauss we use a number of indicators. We employ a yearly engagement survey, ad-hoc surveys (we recently launched an ‘unmet needs’ questionnaire, for example), and regular consultations with business leaders, to name just a few. In addition, we use a number of reports available from various systems to provide people data around absence, attrition, exit interviews, performance evaluations – ‘9 box model’ placings. It’s easy to be overwhelmed with data, but what’s important is using it in a meaningful way. It’s important to be able to centralise the information to make impactful decisions on people strategy going forward, and I am a big fan of only collecting data that will impact the strategy and drive the business forward. People analytics is something relatively new within our business, as previously this was somewhat of a challenge without an HR system, so reporting was often inaccurate. Having implemented a system over the last 12 months we are now able to produce quantitative data, the challenge is using it to make informed decisions. We try to limit the amount of time we survey the business, as they lose impact if too many are issued. However, we run surveys with smaller cohorts of people as part of a focus group to aid improvements in the business. The key challenges to people analytics success are the favouring of gut feeling over data, as well as poor systems, and organisational culture. There’s no one-size-fits-all approach to people analytics, but initiatives should always align with the wider organisation’s strategies. Clearly, the time is now for people analytics. As we see from the commentary, HR is awash with data and the pace of change has the potential to disarm its practitioners. So what can HR professionals do to improve their employee data collection? How can they ensure they’re only collecting the right data and applying the right analytics in order to drive genuinely creative HR initiatives? Andrew points out that we need to take a step back. “HR has been inundated with data since it began – payroll data, core HR data (demographics, performance data etc). The statistics aren’t new and the psychology isn’t new, they’ve always been there. What’s changing is that we’re finding a new wave of practitioners coming into HR, many of whom have backgrounds in statistics and psychological science. They’re getting traction by applying their expertise to solve problems, which makes the rest of the business’ ears prop up and want them to be involved in most commercial decisions. People data is information an organisation has on its pools of people collected from system such as HRIS, payroll, benefits, workforce management system and talent management system. Programme data encompasses information on attendance, adoption, training, development and leadership programmes as well as project assignments. While some metrics work well in predicting future behaviours, others will identify established patterns and trends, enabling us to project them into the future. HR professionals need to understand the importance and application of leading and lagging indicators. Tim Pointer, global HR director and founder of Starboard Thinking, explains the use of both in HR. This is the kind of data that has traditionally been reported on by HR. It accounts for matters such as absence levels, training days or takings per head (TPH) – what are essentially yesterday’s numbers. Focusing on lagging data has the tendency to be reactive, and identifying concerns rather than resolving them. Although lagging indicators are essential for identifying the past return from our payroll spend, for example, we can borrow the school of thought from sales teams who are motivated by tomorrow’s numbers. This is where the new wave of people analytics has the most impact. It accounts for wider business measures such as qualified sales pipeline prospects; confirmed business development opportunities; and the number of existing customers that you’re in discussions with about upgrading their current products or services. From a people point of view, it would mean understanding the strategic investment that you’ve put into your existing team in order to ready them for future success. For example, if an organisation is forecasting a tough time commercially, you may conclude that you need to equip your sales and procurement teams with the best negotiation approach in order for them to get every pound out of each deal. Inaccurate or inconsistent data is the single biggest impediment to the success of people analytics, however a lack of analytical acumen among the HR practitioners deploying it is often also a major obstacle. While directing HR at Pentland, which has a portfolio of some of the world’s most popular lifestyle and performance brands, such as Speedo, Canterbury, Lacoste and Ted Baker, Tim Pointer and his team did a huge amount of work on the culture of business. Their efforts resulted in Pentland being ranked as one of the UK’s top 10 large organisations to work for, and he’s convinced that this was considerably influenced by the way they collected and deployed data. He explains their methods: “I would assess the quantitative to get our numbers, but the qualitative was very valuable. We explored what employees valued about working at the organisation, and also what more could be done to make it a more successful place to work. If you ask people these questions you’ll be amazed what comes back. Then you need to be relentless in your follow-up. A bank had a real problem with sickness absence, caused mainly by stress. It started to identify patterns that were likely to predict when someone was going to take a sick day – school holidays, annual leave usage, and so on. Eventually they found a number of metrics that became good predictors of whether someone was about to take time off work with stress-related illness. Then analytics throws up the big ‘so what?’ problem. We have all these graphs, now what are we going to do with them? This is where you don’t need someone with a PHD to make the intervention, but a pragmatic business person – ideally in HR. Someone who will make the business case armed with the data, explain the problem and propose a solution – in this case, one of the solutions was to establish a 24-hour helpline within the company. And to make people know it was there. The practical solutions to this were to have the option communicated on the intranet and instruct managers to communicate it personally. This activity was quantifiable in the sense that they knew how much it would save them, but it’s not just about appealing to the CFO – there’s also the human element, it’s a long term wellbeing initiative. Our next question asked what advice our HR leaders would give to others using people analytics, and also where they intend to make improvements in their own organisations. It’s refreshing to see that even the most well-known brands are experimenting with ambition. For me it’s about becoming more joined up: we have many systems in HR that are not necessarily linked or integrated. Know your employee profile – what is your employee looking for in a job or career? – but also ask what they will need in the future, what they haven’t even thought of yet, and then be clear on what data is going to add the most value to the decisions that surround that. Ultimately don’t stop talking to your employees; data is nothing if you forget the human element. It’s about understanding your business – I don’t need a full-scale data analysis of every aspect. It’s also hugely valuable to glean inspiration from other businesses that are doing well, and gaining a deeper understanding of what works well in your own. HR could get better at using historical data, the gender pay gap is a good example. It’s very well knowing what’s happening today – but we should be asking what happened a year ago, two years ago. Data is valuable when you can see trends. Further buy-in from key stakeholders – if you’re actually going to run surveys, you need to have a plan of action having analysed the results. If you get the data but don’t follow up, it’s a pointless exercise. The challenge for implementation of actions following surveys relies heavily on the business, depending on size of business - this takes their focus off the ‘day job’ which is running the business, and serving our customers, invariably they don’t have time to implement, it then becomes a hindrance rather than a help and falls by the wayside. There are three main types of HR data: people (payroll, benefits, workforce management system), programme (attendance, adoption, training), and performance (360 assessments and succession programmes). For best results, mix quantitative and qualitative data, and always follow up with focus groups. The typical objectives of people analytics outlined in the second section of this report – driving smarter recruitment decisions and increasing employee performance – will naturally directly or indirectly impact employees experience. The pre-vetting of job applicants to drive smarter hiring decisions, for example, will increase the likelihood of employees performing to a high standard. Andrew explains how many organisations are beginning to use people analytics to balance the behavioural traits of team members to optimise performance. “The best sales teams might be made of a blend of extraverts and introverts. The problem this poses is each will need to be managed slightly differently, while of course having to be set frequent goals and target. If HR can track this kind of data and feed it back into the recruitment process, then the organisation will be less likely to have people leave after three or four months. If attrition happens within the first few months, recruitment has failed. Leading data challenges HR leaders to take a more in-depth view of their teams; to track metrics on their people’s commitments and investments. A manager’s influence across the business (as measured by their peers) and the number of their employees who have experienced promotions are both examples of indicators that can be played off. Tim says that when devising a people analytics plan, he would in fact view it through the eyes of an investor. More specifically, the business metrics and strategies that will resonate with someone who’s highly concerned with the growth of the company. He explains: “An investor won’t just want to know how much revenue the company is currently generating, but also the reasons why they should keep their money invested in our business – a reason that isn’t purely based on last year’s profit. On the business side, this would mean understanding the performance of areas like the performance of our marketing activity and the quality of our sales pipeline. On the people side, they would want to be clear how engaged the employees are – whether they believe in the leadership team; if they are aligned with the organisation’s strategic objectives; if they believe in the longevity of the organisation and the sustainability of its reputation. “Investors will increasingly be asking what skills each individual team needs to succeed, and how the investment has been made to get them future-fit; or whether those skills are being imported as part of the talent that’s being recruited. In the past, I’ve been involved with different brands where an audit has been conducted on a business that’s being acquired – with product stock takes, leases being checked, and a legal examination of customer contracts – but nothing on the people employed. The next question we put to our industry leaders honed in on how they use people analytics to directly impact employee experience and retain key talent. We track how many people are building career paths. With this information we can identify where to focus our training and development efforts, and also where our trainers and managers need support to develop their teams. Our career path enables people to move up and through the business – in some cases this happens naturally, others need support. It’s about looking at the figures and identifying where the progression is or isn’t happening, and understanding why that’s the case. Sometimes this information isn’t clear even when you’re out talking to people – that’s where the data backs up the other conversations. It can’t just be anecdotal, it has to be backed with numbers. The best thing to do is talk to your employees in person – if location permits. People analytics is one of the key factors in the overall employee value proposition (EVP), and is a vital component of a company’s people strategy. Attracting and retaining the best employees to your brand increases revenue by saving on recruitment costs, driving capability, and increasing product knowledge, confidence, loyalty and engagement. The data we collate needs to drive decisions around what a deliberate employee journey should look and feel like. Many employees have a different experience at interview, the first day, the induction and working life in the same company – this can all be driven by the approach of a single line manager. The challenge is whether managers see the correlation between those analytics and their actual experience. It’s quite subjective, you could get feedback about a department as a whole which doesn’t necessarily speak for a specific individual within that department. Armed with personality data, recruiters can increase the likelihood of an employee moving into a successful team where they’re going to be productive. When devising a people analytics plan, think like an investor – ask questions about the levels of engagement among employees: are they aligned with the organisation and confident in its leadership and longevity? People analytics can help to improve your employee value proposition (EVP). Big Benefit or Big Brother? All signs suggest people analytics will become further entrenched into the HR practice. It’s hard to go a single day without reading about the growing capabilities of AI, and how it’ll transform the industry as we know it. Many commentators are voicing humanitarian concerns about the effect people analytics could eventually have on the workforce. It’s not uncommon to hear stories of corporations attempting to track their employees with global positioning systems (GPS), or deploy wearables as a means of tracking how employee lifestyles affect team performance – although both are possible, some of these stories are perhaps less true than others. The argument in favour of such technologies are more compelling. Those leading the change in technology such as artificial intelligence (AI) – Salesforce, Oracle, IBM and Microsoft – explain how it empowers people managers to do their job in a more effective, impactful way. As ironic as it sounds, AI tech can actually help HR become more human. For organisations that are large enough to warrant the use of AI in its current form, it has the potential to make HR more insightful, effective, and smarter about how they engage with people and deliver meaningful experiences. Industry Commentary: What's Next for People Analytics? Before we get too carried away with the Orwellian future of AI and people analytics, it’s worth checking in with the practical reality of its usage. Many companies are going through an iterative process of making sense of the data that’s now available to them, which is challenge enough without bringing more technology into the mix. Our final question to our industry leaders asked what they thought the future holds of analytics. I think there’s a place for it, but the use of analytics varies from one organisation to another. With our organisation we move at such a fast pace that the data is almost out of date by the time it’s received. That has ultimately meant that we have often acted on things with gut instinct, rather than the received analytics at that point in time. That said, the data then invariably supports the decisions that we’ve already made. HR we will increasingly ask to get more information on employees, which is a precarious step. While stories of intrusive people analytics are not unheard of, wearable technologies can be used as a force for good. HR needs to remind itself of its number one objective: to align HR practices with business objectives. Think along the lines of growth, sales and marketing targets, and the retention of clients and employees. Although there’s no one-size-fits-all approach to deploying people analytics, initiatives should align with the organisation’s broader strategies. A bank, for example, might want to improve productivity rates and will therefore focus on reducing sickness absence. A struggling retail business, on the other hand, might need to invest in the negotiating skills of its procurement team. Start piecing together insights from the data that’s already available; the more you add, the richer the insights. From payroll numbers to employee demographics, HR is inundated with data. Start by considering what’s important to the problem and reviewing the people, programme and performance data you already have. This should help you decide where to focus your efforts. For example, a bank with an absence problem would want to identify patterns that are likely to predict when someone is going to take a sick day. It could do this by analysing data around school holidays and annual leave usage to find metrics that predict whether someone is at an increased risk of taking time off for stress-related illness. On a small scale, without large investments of time or budget, begin to tackle the urgent business problems you identified earlier. Adopt a trial and error approach until you gather traction, start seeing results and are ready to scale. One-off projects are time consuming and rarely have instant results – it’s far more effective to review trends over time. Remember that the best way to wow this group is by focussing on metrics that impact competitive advantage directly, and less on indirect ROI and external benchmarks. You have the graphs and analysis, now what have to work out what actions they can they incite. On a small scale, without large investments of time or budget, begin to tackle the urgent business problems. This is where you need a pragmatic business person – ideally in HR – to make the intervention. In our bank example, one of the solutions could be a 24-hour company helpline for struggling employees. Once your people analytics incentives are gathering traction, the organisation will pay attention. With that buy-in, you can start to invest in your team’s analytical skills or the technology that’s necessary. Learn from data-driven statisticians, scientists and other departments such as IT and marketing.